Adrian has always had a fascination for stargazing and after 25 years of employment as a technician with Telstra, accepted a redundancy package. To celebrate his new found freedom he purchased a Telescope because he had always wanted one! The Telescope partly satisfied Adrian's interest for stargazing, but each time he wanted to look into the sky he would have to get the Telescope out the box, set it up, and after viewing, would have to pack everything up again. This became a frustration along with the fact that the trees around their property would obscure the view. Fuelled by his passion to learn more and the above frustrations, Adrian one day walked to the top of a hill on their property, stuck a stick in the ground and said "This is where the Observatory is going!" From that day on the planning and construction of the Observatory began. 12 months down the track (July 2002) it was completed and in operation. See development stages on the Construction page. Adrian and Beth are very appreciative to family and friends who helped make this dream become a reality and invite you to come and view the beautiful Mallee Sky with them. A new visitor centre is now a reality. This room gives us more space for displays and an area for cuppas and chatting. 5.30pm. 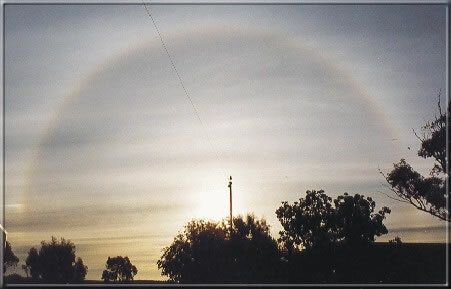 It shows the halo around the sun.This photo appeared in 'Sky and Space' publication. 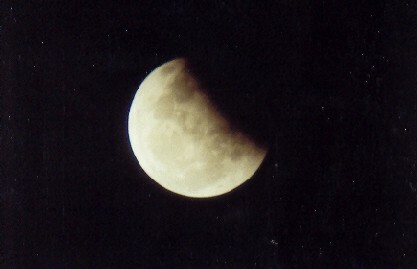 The above photo was taken of the moon being eclipsed by the earth. Taken with a 35mm camera at an eye piece of a 20x80 binocular.